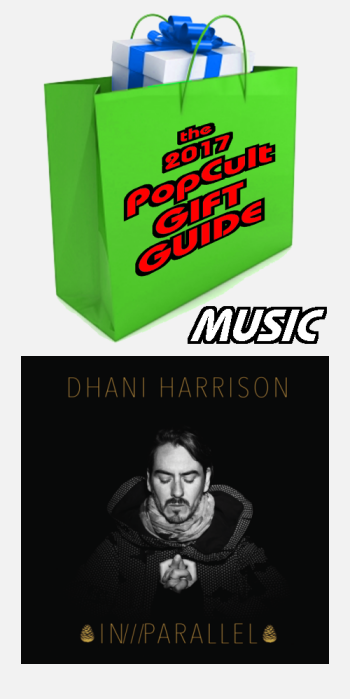 Our music pick today for the 2017 PopCult Gift Guide is the first album that Dhani Harrison has released under his own name, IN//Parallel. Harrison is, of course, the son of a Beatle, and that makes this album all the more remarkable because I’m NOT suggesting that you get this for the Beatles fan on your shopping list. IN//Parallel is the perfect gift for the fan of experimental, ambient, progressive electronica. It has echoes of Nine Inch Nails, Prodigy, Jon Micheal Jarre and Ultravox. While Harrison bears an uncanny vocal resemblence to his father, the music he pursues here is his own. If you get this as a gift for a Beatles fan, make sure that they’re a completist who wants every album released by Fab Four offspring, because this is not terribly Beatlesque. This is an impressive album, which takes the sounds he tinkered with on his albums as thenewno2 and explodes them into a bold new style. With elements of drone, EDM and industrial music in his arsenel, Harrison delivers ten tracks that sound completely original, which is quite a feat these days. After dedicating the last several years to preserving his father’s musical legacy, it’s a real kick to see Dhani Harrison cut loose and explore and establish his own musical territory. You can find IN//Parallel almost anywhere that sells music, or head over to his website for some cool bundles with T Shirts, signed posters and other cool stuff.